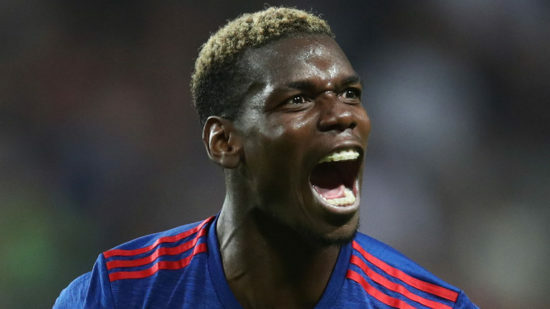 Manchester United fans have laid into club record signing, Paul Pogba on social media after the 24- year-old put in an abject performance at relegation threatened Newcastle. The Frenchman looked off the pace in the game, misplacing passes and offering none of the quality he has. He was duly hauled off by Jose Mourinho on the 66th minute, the second time in 3 matches he has been substituted by the Portuguese tactician. Pogba looked disinterested in the game, and cut a picture of frustration on the bench after another abject performance. The former Juventus man is losing his form at a wrong time, as prior to this rough patch, he has arguably been our best player. Below are what some of the fans thought about his display on Tyneside. He received a 6.2 rating by Whoscored.com, a fact that shows how poor he was. Paul Pogba in a defensive role is like a Ferrari being driven in central London. United suffered a damaging loss at Newcastle, with Pogba at the end of everything wrong we did. In the build-up to Newcastle’s goal, he didn’t climb to stop the header that allowed Matt Richie to stroke the ball past David De Gea. He was overrun in midfield by the likes of Mo Diame and Jonjo Shelvey. Pogba has shown his quality on numerous occasions this term, but he cuts a figure of a player who chooses games he can influence. He should be doing better to help our quest to climb the league table as a number of teams are closing in on us in second place. He has been brilliant this season, registering 9 assists, but he must do it week-in, week-out. Its better to play Mc Tomninay than Pogba,this is not LA galaxy for a player like him playing casual futbal! !lingard shud be dropped and use rashford coz the guy hard pace can dribble and cause a lot of problems to defenders so as to create room for Sanchez and lukaku fo goals!!! Come on ManU, you are blaming players, shouting at the wrong tree. Its the manager to blame, here is my reason: We had two LB, Rojo and Shaw, but had Young playing, why? Young is good player but not for that position. Martial was plating well as No.11, Yes Sanchez is a good player, but was Martial talked to about change of positions. Remember when Zlatan came, Martial was No 9 was given to Zlatan without any talks, player management. Ok Martial seems depressed due to change in position, why not play Rashford at RW? Lukaku is not doing what he was doing at Everton, but is not benched why? Look at ManCity, player rotation, manager is good and look at the way they play, aggression, passion etc. get rid of Jose before we see the EPL trophy. Mourinho for who he is wo t bulk and try to play players according to thier strenght. I wouldnt know why you want to have every player to be on defensive dufies; its not possible, some attack minded players will get exhausted with that kind of instruction abd at such, when its time ti exhibit thier killer instincts, in d final third, thier legs are tired and they just want to pass the ball to safety, cos they cabt stand loosing the ball abd having to run back again and defend. Mourinho is killing this team i kbew frim day 1 he was bit the right coach. He will fight players, frustrate then, make them rigid and not allow them freedom to express themselves and enjoy the beautiful game. He still feels the method that worked in his Chelsea days 03/04 season where they were hard to break down can still work now; no it cant. Managers focus more on attack these days and it pays off. Thus guy should change cos the game is changing everyday.